Updated from Responding to Complexity: A Case Study on the Use of Developmental Evaluation for Managing Adaptively (Boisvert). I. Clearly Defined Mission, Evolving Strategy. CatComm has a clearly articulated mission and regularly affirms that mission to ensure that all involved are on the same page and heading in the right direction. Each year we revisit our broad, guiding five-year strategic plan, updating it with specifics for the coming year, while holding space that maintains the flexibility needed to respond to needs and opportunities as they emerge throughout the year. The organization is thus able to seize timely and strategic opportunities, and leverage the human, intellectual, network, and financial resources we have at our disposal to enhance impact. II. Locally-Led Initiatives, Mutual Learning and Trust at the Core. CatComm actively fosters spaces for community members to identify needs and solutions, and decides what to lend greater support to based on the organization’s Evaluation Criteria* and current resources at its disposal (within the broad organizational network). We are committed to Asset-Based Community Development (ABCD) and approach all our work with favela organizers as such, supporting them in developing and carrying out solutions, building our mutual capacity. We view the trust of community members as our number one asset and hold an absolute commitment to building and preserving that trust. In addition, we take a ‘do no harm’ approach which means following the lead of favela organizers in our advocacy work, from our campaigns through to many of our publications. We recognize that the situation we are working in is much more complex than we can possibly imagine, and we should do whatever we can to ensure we do not harm the lives of those we are attempting to help. 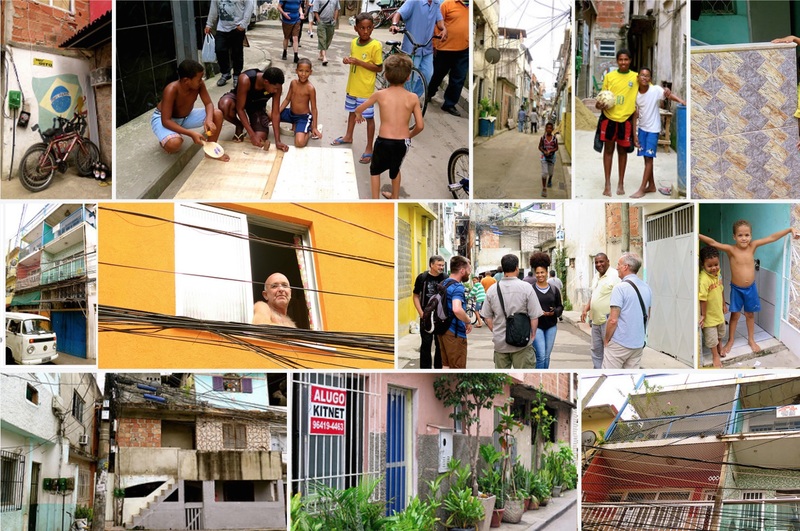 Our work is derived out of a deep respect for favela communities, their incredibly complex logic structures, and the self-built and self-managed nature of their development. Due to our respect for this self-built nature which includes qualities and challenges we can’t possibly fully understand, we do not engage in activities that will mess with any of these unless they are sourced in the actions of residents who seek our support. Furthermore, we believe true, lasting impacts are generated when built on community agency. Mission fit – All actions must directly and successfully attend to our mission and contribute towards our vision of community-led favela integration. Leveraging impacts – The greater the ‘catalytic’ or ‘ripple’ effect of an action towards our mission, the more relevant it is. We also pursue activities that will leverage the potential in other actors within our network. Efficiency and ultimate impact are constantly analyzed prior to taking any action. Filling an important gap – We focus on niche activities unmet by other organizations or actors, that are likely to yield significant gains and jumpstart additional activities (hence leveraging again). III. Ongoing Documentation, Situational Analysis and Contextualization. CatComm regularly documents diverse aspects of our strategies and programs, collects data and feedback to understand hyperlocal (down to the level of individual residents and their relationships) needs and opportunities, and uses multiple relevant and feasible data and feedback collection strategies. Additionally, we constantly monitor local, national and global trends in order to understand the local context and adapt solutions from a broader perspective. IV. Multiple Points of Entry. CatComm leverages multiple points of entry within and across activities, strategies and networks in order to address the complex, systemic nature of the issues we are trying to address. We often work from a variety of angles to address the same community challenge or need, applying a variety of tools and opportunities that we develop or that may come along. V. Culture of Experimentation and Non-Attachment. Through our commitment to long-term outcomes rather than attachment to specific activities, CatComm has fostered a culture of developing creative solutions; piloting them to see what works; and scaling up, scaling down, or changing activities as needed. VI. Network-based Approach. Some Resemblance to Movement Organizing. 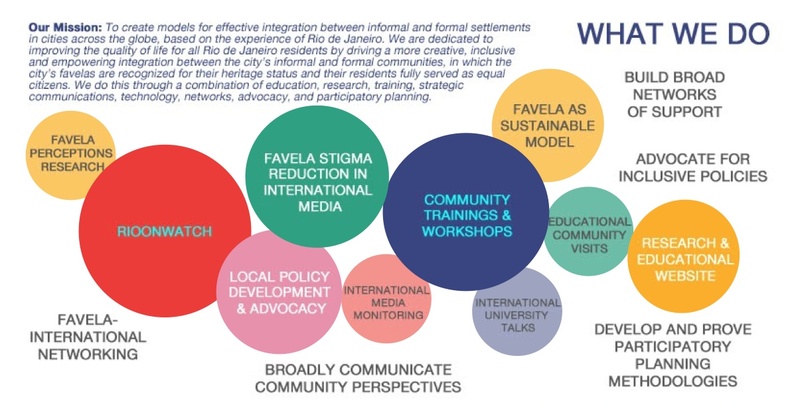 CatComm is not a traditional NGO but rather structured as a network, whereby the core team forms the primary hub in that network, coordinating and logistically supporting the network whose strengths and broad capabilities are applied in support of current and strategic needs of favela organizers. Beyond its own network, CatComm recognizes that social change is a “collective wave,” and the organization follows other movements and organizations, and fosters partnerships on the local, national, and global levels to work towards that change, collaborating with those who are oriented towards the same broad societal goals but with diverse specific interests, knowledge and skills. Finally, by focusing for years on building a trusting and trusted network, we have inadvertently learned, as successful favelas themselves also do, that much can be done in the absence of financial resources, and that developing an organization primarily with non-financial resources (in some ways making us akin to a movement) leads to even greater trust, and reduced conflict and thus greater capacity for effective and efficient action, both among our community partners and broader network at large. Everyone engaged with our activities is involved primarily because of a common desire for an alternative, just development strategy based in the values and potential of favelas. VII. Ongoing, Real-time Data Collection. CatComm collects data and feedback on our activities and on short- and mid-term outcomes. We also monitor relevant long-term, large-scale, and global social change to understand progress being made, albeit by the collective group of actors, and our role in it. CatComm uses varied contextually appropriate and logistically feasible data collection mechanisms, and we both systematically collect feedback and data, as well as foster pathways for feedback and data to be received organically. VIII. Continuous Reflection and Adaptation. CatComm regularly analyzes and interprets data collected on activities, outcomes, and hyperlocal and large-scale change. We make strategic programmatic decisions informed by this analysis and interpretation, in relation to arising needs and opportunities in the community and prior information on similar phenomena in other contexts. CatComm studies its own processes and those of the communities we serve to identify strategic opportunities for replication, modeling and sharing with organizers, other organizations and social movements in favelas and around the world, and document and present these processes widely in order to scale solutions we uncover through our actions. In short, Catalytic Communities focuses its resources (which are primarily non-financial resources through a solidarity network applying its skills, networks and passions) strategically on challenges and solutions identified by communities as being in need of support, in innovative and niche activities unmet by other organizations or actors, in replicable ways, making those resulting experiences accessible for learning by other individuals and organizations similarly dedicated to embedded social and environmental justice around the world. For an evaluation of CatComm’s approach, see Adapting for Success (Boisvert 2017).